There are largely two types of equipment for measuring noise. They are the Sound Level Meters (SLMs) and Noise Dosimeters. The type of equipment to choose for the measurement and recording depends on the purpose of the measurement. Sound Level Meter (or commonly known as Noise Meter) are used for measuring environmental noise (in technical term: frequency-weighted sound pressure level or SPL) whereas Noise Dosimeters are for measuring personal noise (i.e. noise exposure of a person integrated over a period of time). In Singapore context, noise dosimeters are used to measure the noise workers are subjected to in their working environment (e.g. factory). Prices of SLMs can varies from SGD50 to few thousands dollars. The differences lie in the specifications (e.g. frequency response, dynamic range, sensitivity of microphone etc. ), accuracy, class type, advance features (e.g. data logging, detector responses options, averaging, etc. ), durability and technical constructions (e.g. removal microphones, filter sets, additional weighting filters, etc.) of the equipments. All SLMs feature omnidirectional measurement quality condenser microphone, preamp, RMS detector circuitry, displays, and frequency weighting networks, AC and DC outputs used for recording. In Singapore, under NEA guideline for boundary noise limit, only SLMs of international standards IEC60651 and IEC60804 (and comparable standards) comply with the guidelines and regulations whereas for WSH Noise Regulation, SLMs of newer standard IEC61672 are required. Under the older sound level meter standards ANSI S1.4, IEC60651 and IEC60804, SLMs were grade as “Type”. However, newer standard IEC 61672 refers it to as “Class”. For the older standards like IEC60651 and IEC60804, SLMs are classified into Type 0 (highest precision grade) to Type 3. Type 0 is intended for laboratory reference standard. Type 1 is for laboratory measurement and field deployment where the acoustical environment has to be closely monitored and controlled. Type 2 SMLs are for general field application and Type 3 for field noise survey purposes. IEC60651 standard SLMs measure time weighted and frequency weighted sound pressure levels while IEC60804 standard SLMs measure time-average and sound exposure levels. These two standards were replaced by IEC61672 primarily because they did not consider the issue of periodic tests that should be taken at regular intervals to establish the ongoing accuracy of SLMs. Under IEC61672 standard, SLM classifications were narrowed down from four to two, namely, Class 1 and Class 2. Applications for Class 1 SLMs of IEC61672 corresponds to Type0/1 of IEC60651 and IEC60804 standards where they are of high precision grade for laboratory and field uses while Class 2 SLMs are general purpose grade for field use. Humans are not able to hear frequencies in a linear manner. As such, sound/noise level measurement required to be modified/treated over the SLM/noise meter’s specified frequency range. The frequency weighting filters help to achieve that and ensure an accurate representation of how our hearings perceive the sound/noise. There are four types of weightings, namely, A- weighting, B- weighting, C- weighting and D- weighting. In the measurement of loudness, A-weighting filter (denotes by decibel dBA) is commonly used to treat frequencies between 3-6 kHz where human ear is most sensitive and attenuate frequencies that are very high and very low where the ear is insensitive. The frequency curve produced from A-weighing filter is widely adopted for environmental noise measurement and falls under one of the noise measurements to be taken under NEA guidelines on boundary noise limit for air conditioning and mechanical ventilation systems in non-industrial buildings. 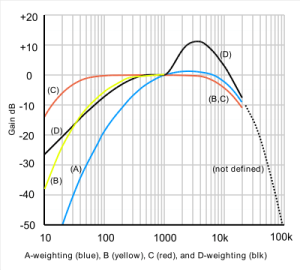 C-weighting filter (denotes by decibel dBC) treats all frequencies the same and thus provides a more flat frequency response. Many sound level meters provide C- weighting and it is a mandatory filter in Class 1 SLMs. Under Singapore WSH Noise Regulations, both A-weighting and C-weighting measurements are required. The older B-weighting and D-weighting are seldom in use and are no longer described in the standard IEC61672:2003 even though their frequency responses can still be found in the older IEC60651. Other than the type of noise meter used in the measurement, another important factor to consider is the setting of the environment where the measurement is carried out. For a noise nuisance measurement to be accurate, there should not be external noise generating factors exist. In the context of conducting a measurement in residential premises such as in a HDB flat, windows and doors should be closed, occupants should not be present, noise or sound emitting devices such as alarm clocks and phones should be switched off. Measurements should be carried out over a minimum span of one hour and at location or spot in the house that is accessible to the occupants and where the occupant/s are subjected to the greatest disturbance. As on the date of this writing, there is no noise regulation for residents to abide by. While it is stated in one of the clauses under Community Disputes Resolution Tribunal (CDRTs) Act that an individual residing in a place of residence must not intentionally, recklessly or negligently cause unreasonable interference (which includes excessive noise) to his or her neighbour, it does not clarify what amount to the term “excessive”. A point of reference that can be reasonably considered will be the NEA Noise Regulation on maximum permissible noise levels for construction work. Pertaining to whether such data can be served as evidence in the Community Disputes Resolution Tribunal, it is still a question mark. Despite the lack of existing HDB guidelines or noise regulation for residents, noise recorded data can be useful in justifying your case either when you approach your neighbour to highlight the nuisance or proceed to mediation.